Tony started off, like several of us in CARS, as a Youth-in-Training in the Post Office Engineering Department (POED), two years of "apprenticeship" that let us see many aspects of work before they let us loose on expensive equipment or unsuspecting customers. His over-riding memories of this spell seems to be how to make tea strong enough to stand a spoon in for overhead gangs, and the careful use of moderate language if a man up a pole drops hot lead on a man down a hole. National Service then intervened, and he Instructed on radio at The Royal Signals, Catterick Camp until his return to the Southend Area on Radio Interference duties. He seems to have learned his renowned skills about domestic and other appliances by fitting suppressers to them. At this time he was also in charge of Kelvedon Hatch microwave link, and when promotion followed to Telecomms HQ, it was to the Microwave Group. As well as permanent and temporary microwave links, the PO tower was awash with them. Hitherto undisclosed tales of water in waveguides and bombs in the loo were revealed. Further promotion to the HF aerials group coincided with the decline in HF DX links, because of satellite working, but maritime still needed HF, and his first job was the conversion of the HF aerials at BT stations to the maritime frequencies. Promoted to Head of BT Aerials and Structures Group, and photographed at the top of mighty masts proved he was now a hands on and feet and safety belt on, senior engineer. Further tales followed of taking down the dish feeder at Goonhilly, (and its too fast last minute descent), unbreakable bottle screws for stays, how weird looking aerials worked and how to climb them safely, radio links to the Falklands, and with the splendid tale of a check of BT aerials using an amateur rig and aerial to see how well the BT ones compared. The design of the Spiracone, looking like a giant children's top, was one type that several club members knew about, and the tale of the huge aerial at Rugby that turned out to have a dastardly effect on the 60khz national time signal, (by having a half wave component), proved yet again that the well known law about "serious operational difficulties" never fails. Another promotion, and he became Chief Engineer of BT Maritime Radio, with responsibility for the great stations such as Rugby and Criggion. Photographs of giant tuning coils, huge self-assembly valves and more mighty masts were interspersed with references to his new role on a national level for BT radio services. There was the lovely story of the farmer who rented the radio station site, and was putting up a barbed wire fence beneath an umpteen kilowatt aerial when it started transmitting. To justify the talk's title, Tony concluded with a short discussion on the interesting properties and uses of VLF, and the questions, and audience reminiscences began. Thanks, Tony, for a very entertaining evening. John, G8DET explained that this month's Meeting was a 'social evening ' with the intention of appealing to a wider audience of wives and girl friends, aka XYL's and YLs, of whom we welcomed ten! Colin started his talk by explaining that "a navigation" is defined as a river which has been made into a navigable waterway as opposed to a purpose-dug canal. He surmised that we had probably seen reports in the press about the financial difficulties experienced by the Chelmer & Blackwater Navigation Company, which was nearly liquidated, shut down and sold off. There had been a number of options. In the end the Inland Waterways Association came to the rescue! Although not in their normal remit the local branch decided, after much hear searching, to involve themselves in taking over and developing the assets. 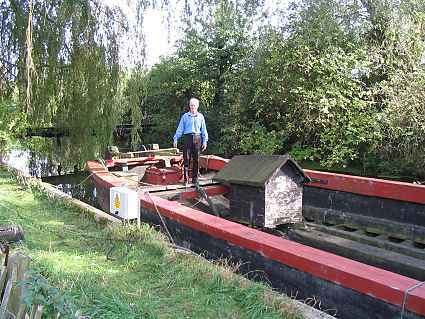 A wholly owned subsidiary of the IWA, called Essex Waterways was formed. Because of the connection with IWA it now has charitable status and a very much brighter future! The Navigation Co. is still in existence for very necessary legal reasons, otherwise the land would have to be returned to its original owners or their successors! As early as 989 AD Vikings had reached Little Baddow and the Monks of Beeleigh Abbey had used the River Chelmer, being tidal in those days, as a means of transport to nearby churches. As far back as 1677 there had been suggestions for making the Chelmer navigable from Maldon up to Chelmsford but it wasn't until 1766 that an Act of Parliament was passed to make the river navigable from Fullbridge at Maldon up to Moulsham Bridge. Unfortunately only half the money required could be raised so the scheme had to be shelved. The main beneficiaries of the scheme would be Chelmsfordians but the citizens of Maldon felt they would lose out on harbour dues and wharfage etc. 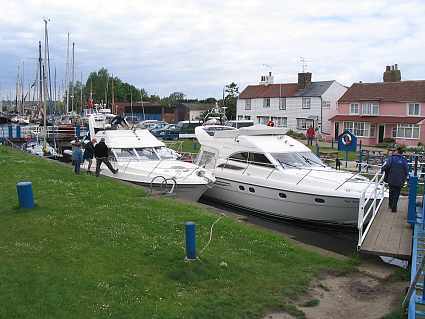 However matters did not rest there and in 1792 a fresh scheme starting from Springfield Basin was prepared which would bypass Maldon and reach the sea at Heybridge. The section from Beeleigh to Heybridge would by definition be a canal. Difficulties in raising the necessary capital, about £40,000, were encountered and some of the money was raised in Leicestershire as folk there, who had experience of canal building and use, realised better than Essex locals that such a scheme could make a profit! However, it has never been a money maker, with only minimal profits. The coming of the Eastern Counties Railway in the 1840's didn't help! John Rennie, an experienced engineer in canal construction, was employed to oversee the construction and the works were completed in 1796 under the direct supervision of Richard Coates. Due to the height difference of about 78 feet between the two ends it was necessary to construct 12 locks. Each lock was 68ft. long and 17 ft. wide sufficient to accommodate lighters 60 ft. by 16 ft. and capable of carrying up to 30 tons with a draft of only 21 ins. A good supply of water is required to replenish the losses due to locking. The Chelmer and the Blackwater rivers together drain two thirds of Essex and it is also fed by streams along its length. Two barges were mentioned during the talk. One was the "Susan" presently at Sandford Mill and now under the care of the Susan Trust, which is charged with raising £250K for restoration. It is a pig to navigate, apparently! The other vessel is the recently re-bottomed "Julie" which is a steel boat and handles excellently and used as a work boat. The Navigation supports a lot of wildlife, is a most enjoyable and relaxing environment for leisure. However, we were told that cyclists do tend to chew up the tow-paths! After the talk there were many questions and this, clearly, is a story yet to run its course. Colin's presentation was illustrated throughout with a series of interesting slides and delivered with an entertaining sense of humour that was a real joy to listen to. Thank you Colin. Chairman John, G8DET opened the Meeting by welcoming Members and Visitors. He introduced Gwyn, G4FKH and asked the audience to note that he was wearing a blue tee shirt - more later. 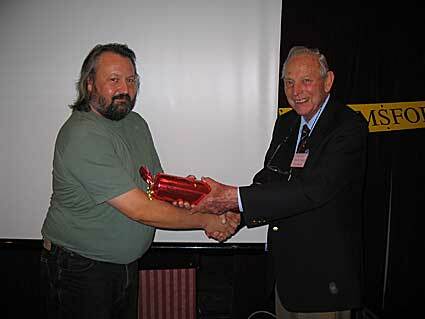 Carl G3PEM was invited to conduct the Presentation by Vice President Geoff Mills, G3EDM (left) of the "Amateur of the Year Award" to Brian, G3CVI for his services to CARS. 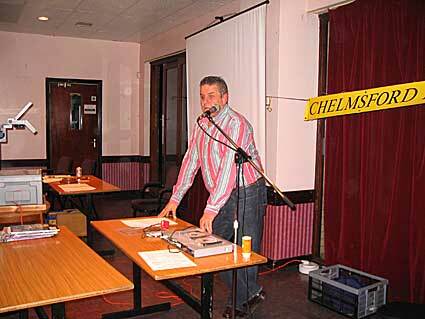 Brian is Treasurer, Membership Secretary and he also organises the CARS events at Sandford Mill. Carl explained that he had obtained a new Trophy as the previous one was looking a bit worn. Patrick, M0XAP - the Special Prize, for his antenna projects. 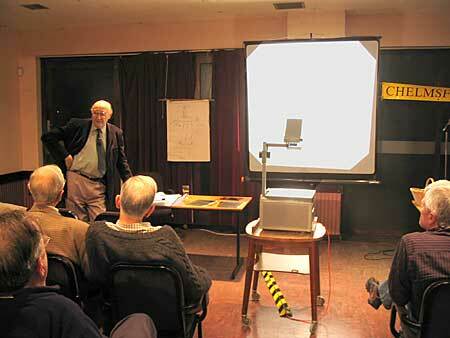 2nd Prize to Carl G3PEM, for his Vertical HF Antenna. John thanked Geoff, G3EDM and opened the AGM by recording apologies from our President Harry G5HF, Tony G4YTG, Brian G4CTS, Trevor M5AKA & Andrew G8LWS. He then read the Minutes of the previous AGM, which were agreed as being correct. Their acceptance was Proposed & Seconded. There were no questions resulting from this. Geoff, G3EDM gave the President's Report by thanking everyone who had supported CARS & said that without help the Club would not succeed. He said that the role of the Radio amateur was changing, as more professionally constructed equipment replaced home construction & the development of new techniques such as Digimodes, the Internet & ECHOLINK. 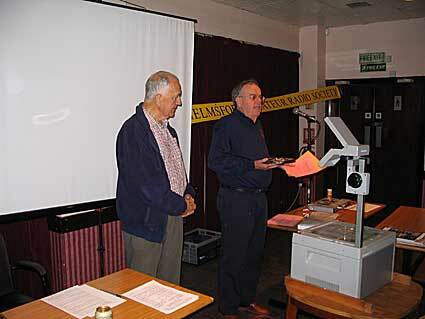 Geoff was followed by John, G8DET who integrated the Secretary's Report with his Chairman's Report. Jim, 2E0JPS is the Minute Secretary & Martyn, M0VAM is the Programme Secretary. Both did a great job during the previous year with their individual tasks but would not want to change. John thanked the Committee for the work they had done during the past year and noted that Chris, G0IPU was stepping down from the Committee after 19 years to reduce his work load. He will continue with the valuable Training role for CARS in Danbury. Ron, M3CAM & Denis, M0FHA were also standing down. Denis would continue as Postal Secretary, assembling and posting the 40+ CARS monthly Newsletters with help from his Wife Jo. Trevor also was standing down, it was thought due to work commitments. 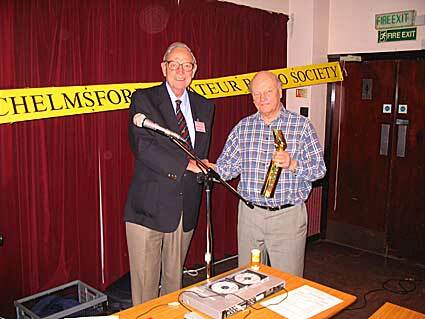 Murray, G6JYB was thanked for his work as the Newsletter "finisher", Training commitment & his OFCOM involvement. Brian then took the stage with his Membership hat on & said that we now had 109 Members. This was down on last year but mainly due to the large coverage area the Training Group catered for, with many people not having any real association with Chelmsford. Brian then said that he was changing hats as Treasurer. CARS major expenditure was the MASC Room hire but we could afford it even though he had been told it was going up during the year. 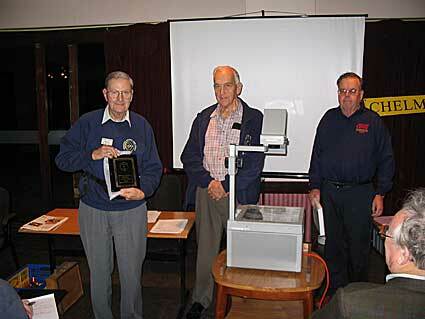 The Raffle was a major event in but with donations it provided a steady income. He proposed that the subscriptions remained the same even though our previous year Income did not quite match our Outgoings. This was voted on and agreed. Clive Ward, G1EUC, as Training Officer took the stage and told the audience about the previous years Training Program which had been very successful, including one Blind Candidate who very nearly got all questions correct at his test, except a controversial one. Clive asked the audience if they knew of anyone who would like to take the Foundation Course, as he felt they had nearly exhausted the supply of pupils from Chelmsford. The Chairman retired the old Committee and asked Vice President Charles, G0GJS if he would be so good as to present those retiring with a bottle of wine, as a token of CARS appreciation. These included Chris, G0IPU - Denis, M0FHA - Ron, M3CAM and Trevor, M5AKA. A bottle was also presented to Carl, G3PEM for his past work as QSL Manager for a number of years before handing the job onto Patrick, M0XAP. Vice-President Geoff then Proposed that those who wished to further serve on the Committee for the coming year be voted-in, en-block. - this was passed. He said that CARS had the power to second Members to serve on the Committee in the future. 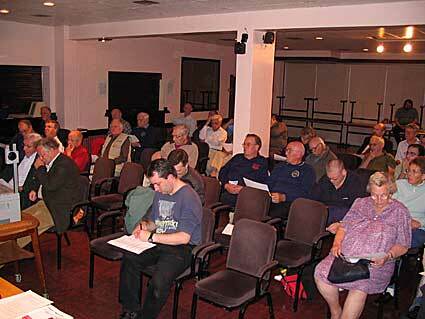 The AGM closed at 8.25pm. 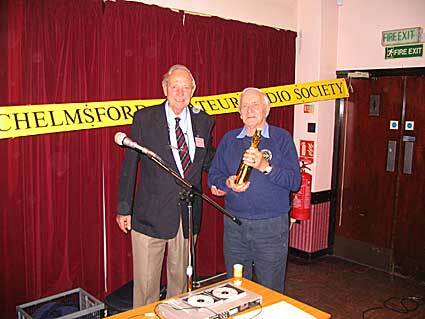 Chris set up the SCARF digital projector and John showed 218 pictures of the past 70 years of the Radio Societies in Chelmsford. It had started by being called The RSGB Group with about 12 Amateurs, who used to meet in various houses including Lawrence Fuller, G6LB & James Watt, G6ZC. It then met in F E Smiths Radio Workshop in Moulsham Street before moving to Marconi College in Arbour Lane in 1952. 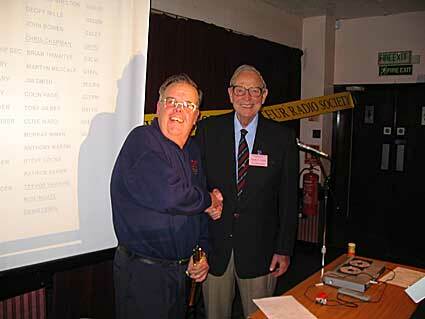 In 1958 it became the Chelmsford Radio Club & finally CARS in 1966 when Tony Dix, G5IX produced the first Newsletter on an experimental basis for 3 months. Gwyn's tee shirt featured on 2 pictures taken in Arbour Lane 10 years ago as did Andrew, G4KQE, Geoff, G3EDM and the late Ron Ferguson G4VF. Roy Martyr, G3PMX & Rev. Wally Mills, G3MCO, were also featured. The audience recognised a number of well-known personalities in the film show. The material was obtained from Trevor M5AKA's, CD and from scanned-in pictures & QSL Cards at a later date. After the refreshment break & raffle, Carl showed a film of the Bunesfield Oil Depot fire, which occurred in December 2005. 2 Satellite images were shown taken by Doug Bone, G4MOI where the smoke cloud could be seen from space.